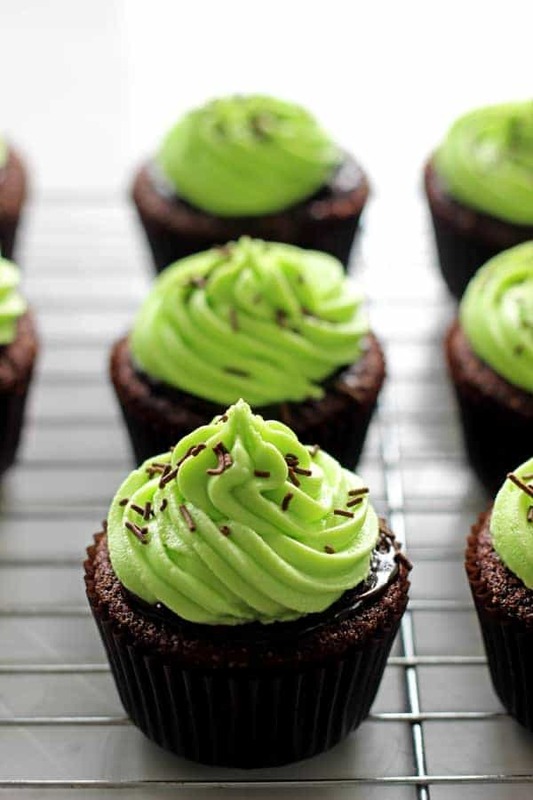 Celebrate St Patrick’s Day with Chocolate Baileys Cupcakes with Mint Frosting – moist chocolate Baileys cupcakes, Baileys ganache and mint green frosting! 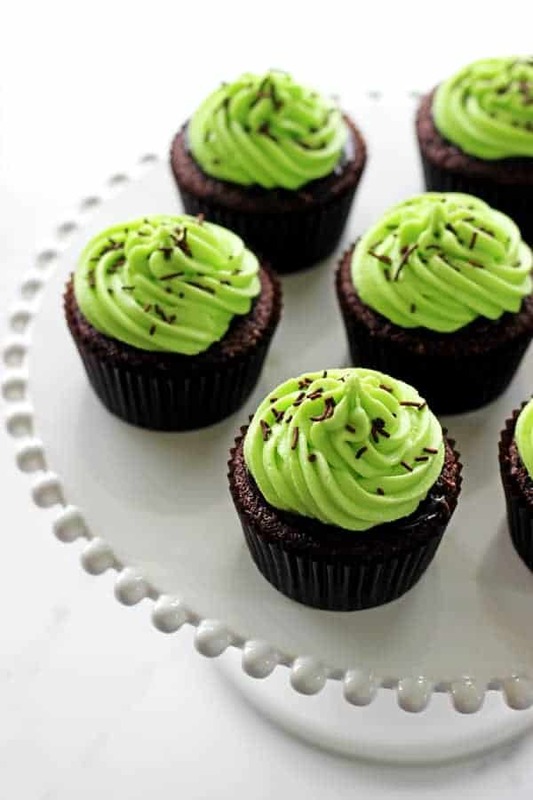 Even though this year I won’t be celebrating with an Irish coffee first thing or Guinness for breakfast you can bet I will be wearing green & eating Chocolate Baileys Cupcakes with Mint Frosting. It’s tough, but replacing beer with cupcakes is something I’m ok with. 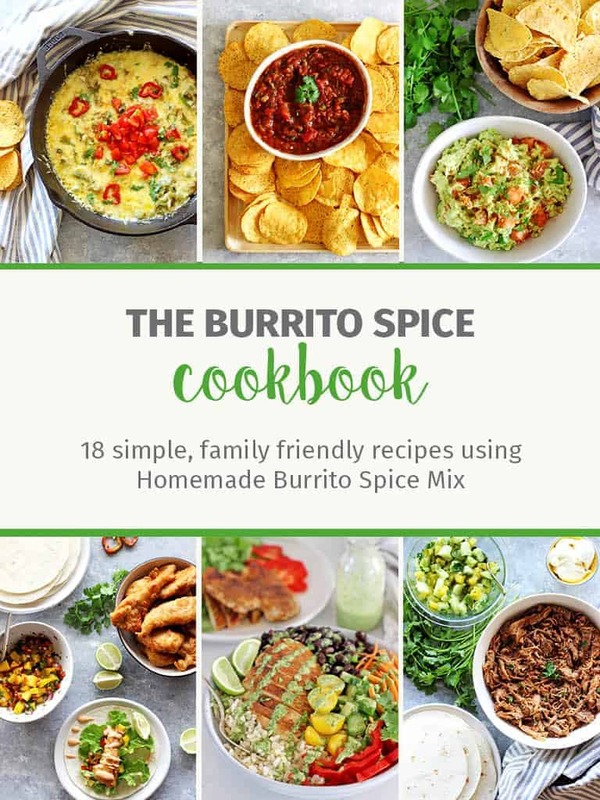 And I knew I needed to bring you an epic green recipe in case you had a sudden desire to make something festive! Being the super responsible pregnant person that I am, I’ve steered clear of anything super boozy this year but I still couldn’t help myself and put Baileys in the cupcakes. Aaaaand in the ganache. Sorry! It’s St Patrick’s Day! Which – side note – did you know that you can substitute Baileys for cream when you’re making ganache? Neither! But I had no cream, really wanted ganache to go in the centre of the Chocolate Baileys Cupcakes and figured I may as well try and make them even more Irish if I could. So I melted equal quantities of Baileys and chocolate to make the most delicious ganache I’ve ever had in my life. It’s the perfect thing to have with these cupcakes but I suspect it would also go extremely well on ice-cream! 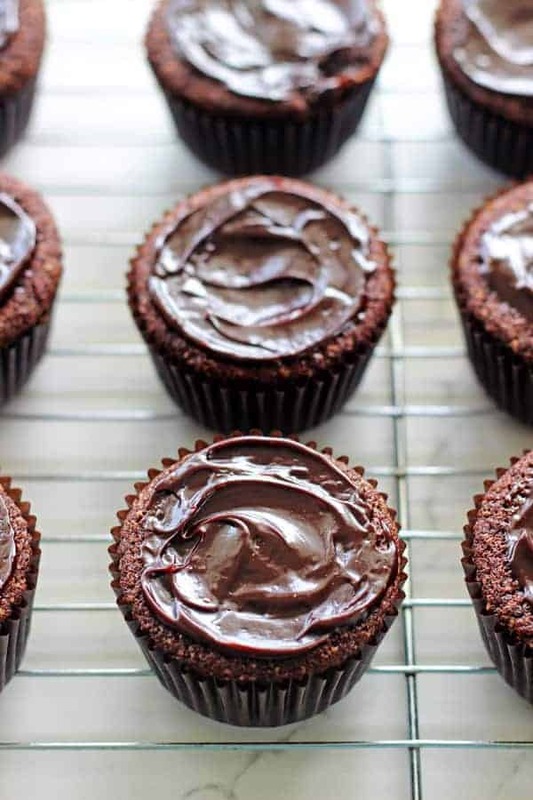 The cupcakes themselves are perfect little chocolate pudding cupcakes. 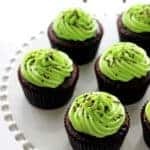 Because of the Baileys in them (yessssss, super Irish but if you’re worried about it, the alcohol evaporates off when they bake) they won’t have the perfect domed tops that we love with cupcakes, they will instead sink down slightly into little dents. Perfect for filling with the Baileys ganache and then piping over top the perfectly green mint frosting. And then covered in chocolate sprinkles. Duh. Also, I used the Chocolate Luxe Baileys because I had an open bottle and it’s clearly not being used at the moment. 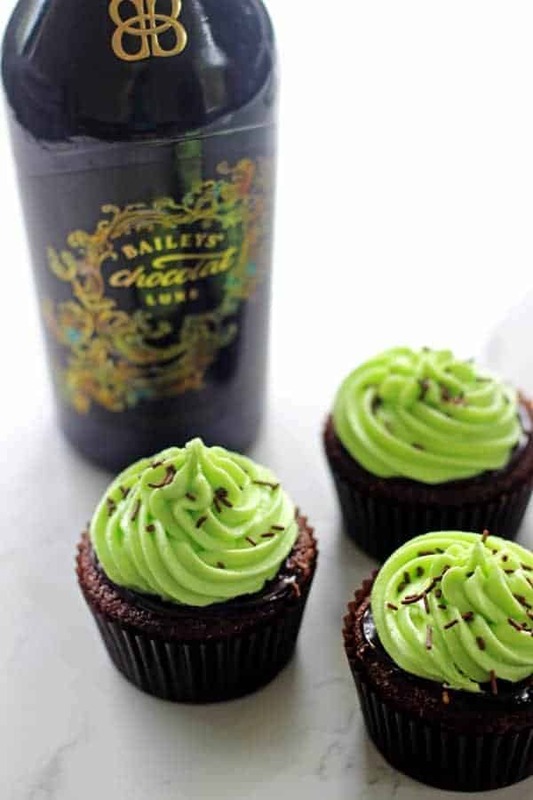 This made the cupcakes and ganache extra chocolatey, but regular (or any other flavoured) Baileys would be perfect too. 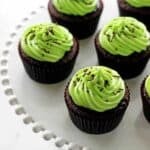 These Chocolate Baileys Cupcakes are perfect for St Paddy’s Day celebrations, but are also a winning dessert anytime of year. You can leave out the peppermint extract from the frosting and change the colour to theme them to any event. The cupcakes will stay fresh for about 4 days…if they last that long! If you need more St Paddy’s Day inspiration, try here! 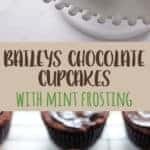 Celebrate St Patrick's Day with Chocolate Baileys Cupcakes with Mint Frosting - moist chocolate Baileys cupcakes, Baileys ganache and mint green frosting! In a stand mixer or using a handheld mixer, cream butter and sugars until pale and creamy. Add eggs 1 at a time and beat for 30 seconds after adding each one and for another minute until well incorporated. 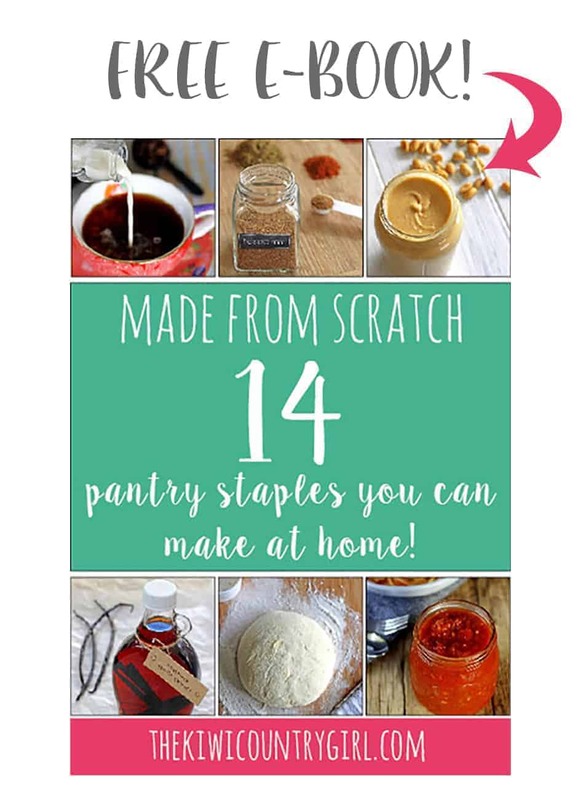 Use a spatula to scrape down the sides if necessary. 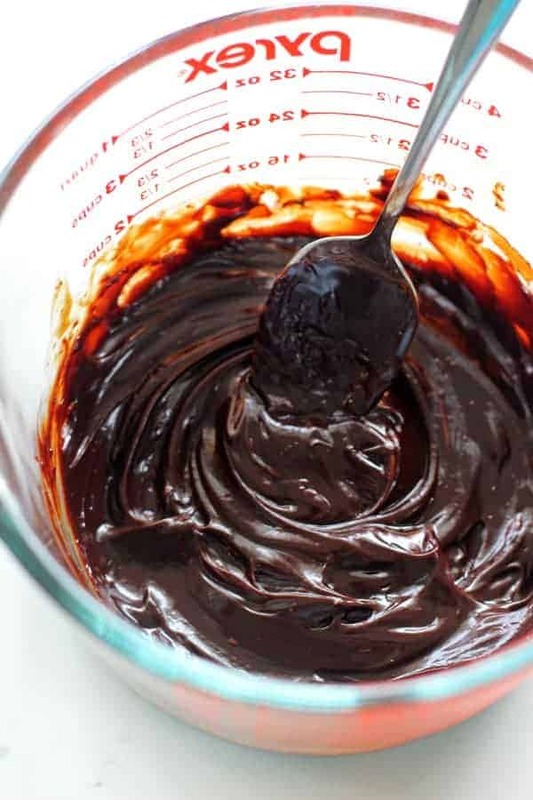 Whisk together flour, cocoa powder, baking powder, baking soda & salt in a separate bowl. Add the flour mixture to the batter start to combine. Add the Bailey & milk to the batter and beat on low-medium speed until completely combined. Scoop the batter into lined muffin tins and bake at 180 degrees C for 15-18 minutes until a toothpick inserted comes out clean. 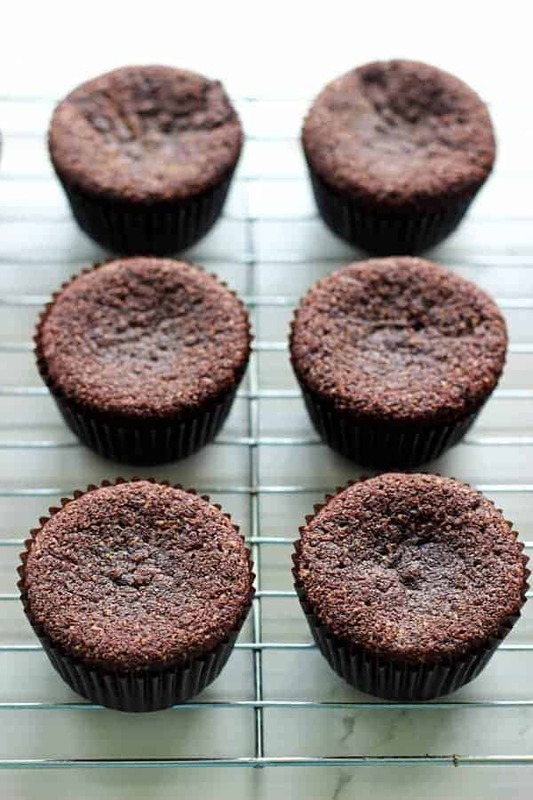 Place cupcakes on a cooling rack and allow to cool completely before frosting. Add Baileys & chocolate chips to a Pyrex jug or over a double boiler on the stove. Either microwave or simmer until the chocolate has totally melted. Stir it together so that it is smooth and allow to cool slightly before spreading onto the cupcakes. Add all ingredients to the bowl of a stand mixer and beat on high speed for 4-5 minutes until frosting is fluffy. Using a piping bag or a knife, pipe or spread the frosting onto the cupcakes on top of the ganache. Sprinkle with chocolate sprinkles. Store in an airtight container for 3-4 days.